4'10" x 16 1/2" x 1 15/16"
5'0" x 17" x 2"
5'2" x 17 1/2" x 2 1/16"
5'4" x 18" x 2 1/8"
5'6" x 18 1/2" x 2 3/16"
5'8" x 19" x 2 1/4"
5'10" x 19 1/2" x 2 5/16"
6'0" x 20" x 2 3/8"
6'2" x 20 1/2" x 2 7/16"
6'4" x 21" x 2 1/2"
The first Ku model was created after a request from the stylish, free surfing charger and aerialist Josh Ku to “make something really freaky, but functional” Out of the desire and challenge to push the limits of wave riding design, the Ku model was born. 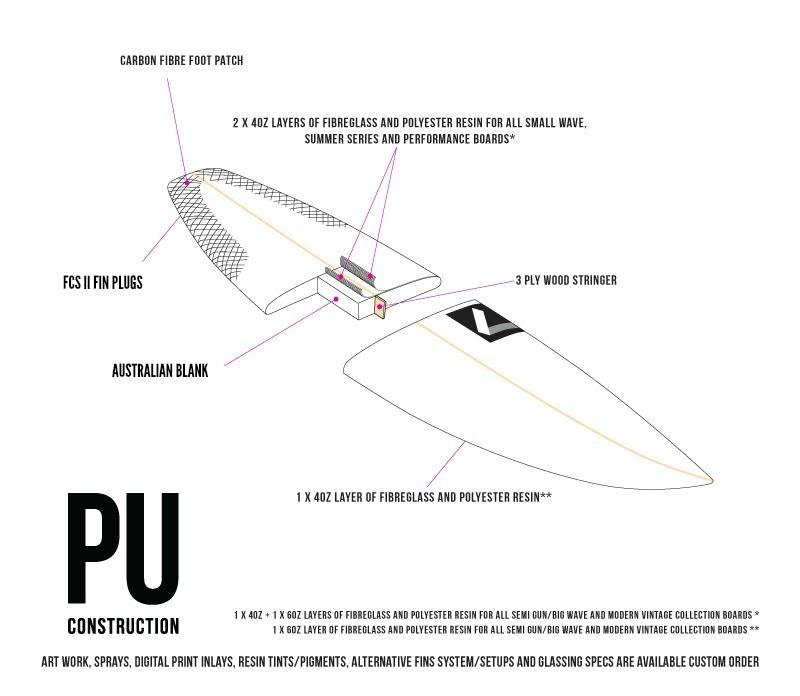 Working with Josh we refined the hydrodynamic architecture of the surfboard to create a surprisingly fast and familiar feeling board. A parallel outline naturally reduces drag and enhances lift, with a moderately low rocker and single concave creating instant planing speed. The unique tail shape further reduces drag, with a 4 channel bottom in the wide tail ensuring precise directional control through turns and a smooth and ultra forgiving ride. The flat deck design has increased volume while enhancing sensitivity, resulting in balanced foam distribution throughout. Freaky yes, but extremely high performing functionality.